According to one Vanuatu legend, still retold today, a domestic dispute was the inspiration for the first case of “land diving.” The story holds that a local woman named decided to flee from her cruel and violent husband. Running away from him, she climbed all the way up a tall tree, but he climbed after her. When she reached the top of the tree, she tied vines to her ankles and jumped into the air. Her husband, confused, jumped after her. However, he had not tied any vines to his legs. He hit the ground and died, while she survived and went on to live happily without him. According to the local lore, local villagers decided to build a platform and practice jumping so that they wouldn’t be tricked by their wives ever again. Ever since, jumping from the platform has been a ceremonial display of one’s manhood. In the West, a form of bungee jumping was proposed as early as 1892, for the Chicago World Fair. 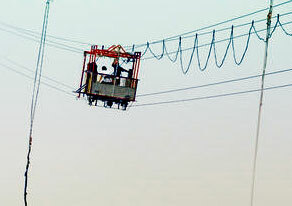 The planners of the event intended to suspend a large car from cables made of high-quality rubber. The car would be pushed off a 4000-foot tower and allowed to free-fall and then bounce to a gentle stop. However, the Chicago Fair organizers opted against the plans before they could be carried out, deeming the undertaking too risky. The first modern bungee jump took place in 1979, on April Fool’s Day. A group of students, who belonged to the Oxford University Dangerous Sports Club, jumped off the Clifton Suspension Bridge in Bristol, England. The group traded out vines for nylon-braided, rubber cord. True to their school’s prim and proper aesthetic, the four jumpers all wore top hats and tails. Having succeeded at their landmark jump, the Oxford students were promptly arrested and jailed for several days. Nonetheless, the jumpers carried on with their brand-new sport, first jumping from the Golden Gate Bridge and then the Royal Gorge Bridge in the United States. The latter jump was filmed as part of the popular television program That’s Incredible. The word was out, and within a decade, bungee jumping would become the thrill-seeking adventure activity par excellence. By the end of the 1980s, bungee jumping had found a new champion in A.J. Hackett, a New Zealander with a passion for record-breaking jumps. Hackett’s first jump was in 1986, off Auckland’s Greenhithe Bridge. Within the next year, he would put bungee jumping in the spotlight with a highly publicized jump from the Eiffel Tower. In 1987, Hackett opened the first commercial jump site, bringing the sport within the reach of a newly eager public. Hackett was among the first to use the word “bungee”, and he may have coined it, himself. In the UK, “bungy” may refer to something thick and squat or, in some dialects, to a rubber pencil eraser. In New Zealand, the word was slang for elastic strapping, such as the cords used in a modern jump. 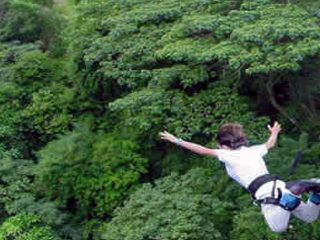 Monteverde, Costa Rica is a mecca for bungee jumpers, with many outfitters and jump sites. Extremo Canopy Bungee is among the newest jump providers in the area. 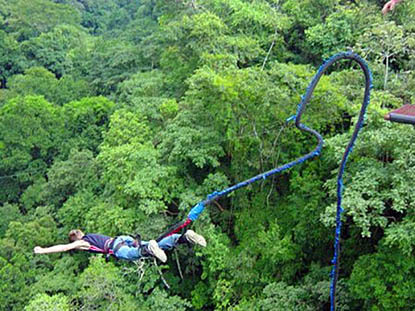 In addition to letting you take the highest bungee jump in South or Central America. Extremo also offers ziplines canopy (including a Superman cable) and a Tarzan swing. The Tarzan swing is the highest of its kind in the region and, per Lonely Planet Guide, the most “adrenaline-addled.” Thrill-seeking participants are provided with transportation to the jump site, approximately a half-hour drive from most Monteverde hotels. For late-risers unable to make the 8 a.m. jump, the late-morning tour starts at 11 a.m. and another runs daily at 2pm, though with more limited offerings. Anyone 18 years or older and at least 52 kg (115 lbs.) can jump.